The H-750 is used to exhaust air from a pipeline while it is being filled and to prevent a vacuum from forming when the line is drained. The ball shaft is fully guided to insure proper alignment between ball and seat. The seat is accurately machined for precise seating. An optional resilient seat is available for drip tight shut-off. 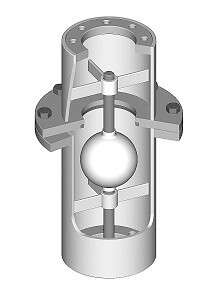 The valve has a two-piece body to facilitate maintenance. The H-750 can be fabricated from any weldable alloy and is clearly marked to show direction of flow. Sizes 3″ to 12″ are standard, but larger sizes are available. Optional abrasion and corrosion resistant designs with hard facing availabe in Stellite, Tungsten Carbide, Pulse Fusion.